Circle of Blue’s senior editor will be filing reports from China for the next three weeks. See what he has to say about Beijing’s Blues Festival and a beautiful blue-sky day. 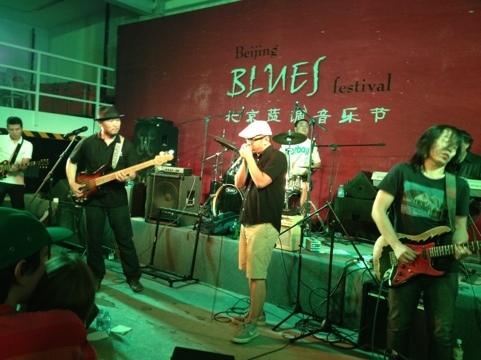 Beijing’s Blues Festival is a pleasant surprise. BEIJING, China — On Saturday evening here in China’s capital and second-largest city, the music of Wilson Pickett and B.B. King, Muddy Waters and Sam and Dave, poured from the arts district in a new area of town. In a city this, big it’s easy to expect excellent musicians. But the Chinese lead singers, sweating out the lyrics in English — “Ride, Sally Ride!” — was a surprise. Beijing will do that to Americans. Surprise them with talent, scale and class, and the managed frenzy of so many people so driven to get there, somewhere, anywhere. I am in China for three weeks, along with Nadya Ivanova of the Circle of Blue staff, to conduct research for our next Choke Point: China report later this year. My trip takes me to central, northeast, coastal, and southwest China to understand more about this nation’s confrontation between diminishing freshwater reserves and rising demand for grain and energy. 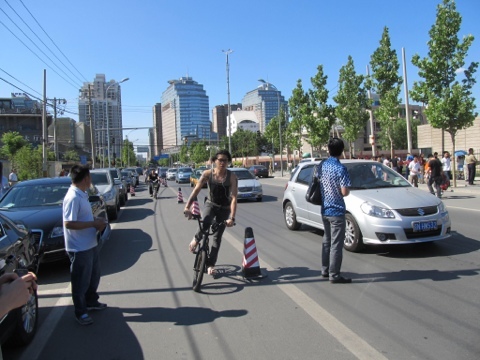 Our work is undertaken with the expert help of Jennifer Turner, director of the China Environment Forum of the Woodrow Wilson International Center for Scholars in Washington, D.C.
Cars and bikes stream through Beijing’s busy streets on a beautiful day with blue skies. This is my fifth trip to China (and my fourth to Beijing) in 20 months. As in previous trips, the world’s largest nation is keenly interesting. Yesterday, I was surprised again. The sky was blue. Authentic blue. Bluer than I’ve seen in all the days and in all the provinces (9 so far) that I’ve visited here. Blue like it gets in Michigan and Chicago and New York. When the Chinese figure out, as we did in the United States, how to limit emissions and clear the skies, they’re going to discover how beautiful their biggest cities really are, and how scenic their countryside can be. On a warm and bright day — like yesterday, when Beijing was aflame in colors that most of the city’s residents only see episodically, when the smog clears and the light of the sun has a Mediterranean intensity — Beijing is a striking city, full of architecturally distinguished glass and steel buildings, fronted by big flower gardens and 12-lane boulevards just paved black. Right now, the cities and rural areas here exist in a haze that obscures, a veil of dust and pollution, that most days treats the sun as a dull orange disc and keeps the mountains hidden. But on a beautiful blue sky day, the full measure of a city that is Beijing, and a modernizing nation that is China, is more fully revealed.